It is coarsely unfortunate that I do not end up watching a lot of movies. In fact by the time I realize I want to watch a particular movie, it has already been running in theaters for a month or so and on the verge of being taken off. I was however very keen on catching ‘Bhaag Milkha Bhaag’ – a biopic on India’s greatest sprinter of all time, Milkha Singh from the moment I heard about it. My sister happened to be a state level athlete at a young age. I’ve spent a good part of my childhood training with her and watching her train in admiration. The dream of becoming a professional athlete however was cut short once she started realizing how track & field is one of the most ignored sport in the country. Naturally, I was drawn towards athletics and the Flying Sikh – about whom I had heard so many fabled stories. Bhaag Milkha Bhaag starts off with one of the most memorable 400m sprints in the history of Summer Olympics – Rome, 1960 – the only time India had realistic hopes of an individual track & field gold. Milkha leads for most of the race until he turns back to look at his opponents, has a flashback reminding him of his greatest personal tragedy and loses focus to eventually lose his lead and finish 4th. The first 4 finishers in this race ALL broke the then World Record (Milkha himself clocked 45.6 sec at 4th place). The dramatization involved in this scene (as in many others throughout the movie), is one of the rare weak points of the movie. Without giving much away from the plot, the story tracks Milkha’s life from an orphaned child, fleeing from Partitioned Pakistan post-Independence, to becoming a dacoit, falling in love, joining the army and finally racing his way to glory. There are very recognizable glimpses of the Rakyesh Omprakash Mehra touch throughout the movie. The color-sepia transitions between flashback and present, pleasantly remind you of Rang de Basanti and the way Mehra connected Bhagat Singh’s story to a modern day group of disgruntled young men. The pace of the movie is rather slow and drags on a little longer than most people would like. Like my friend next to me casually remarked – “if I was interested in athletics, all these repeated drills would excite me; but I’d much rather watch Sonam Kapoor wear 10,000 designer dresses in a movie, because eventually I’m a girl”. Ridiculous as it may sound, it makes sense to an extent. Although ROM specifically says he wanted to portray the discipline and training that went into converting a lean, lanky Milkha into the athletic, muscular Flying Shikh, a good portion of the crowd doesn’t want to see Farhan Akhtar cringing his singlet to fill a bucket full of sweat 10 times in the same movie. Other than that, the movie is beautiful. Some scenes simply stand out. There’s this one scene, where a youthful Milkha in his dacoit days is trying to pass a police chowki with two jars full of ghee. The corrupt havaldaar who seems to hold a grudge against Milkha doesn’t let him pass unless Milkha agrees to leave one of the jars for him. Milkha then proclaims “us paar to main jaunga, aur dono dabbe saath le jaunga” (I will pass through and both the jars of ghee will go with me). Akhtar then proceeds to sit down and empty both jars of ghee into his mouth; punctuated by multiple bouts of push-ups with a sizable crowd cheering on and counting each rep much to the anguish of the onlooking havaldaar. There are several such reminders of Milkha’s youthful rebellion and reluctance to give in to the injustice of the world around him which moves you at a deeper level. Another sweet little sub-story within the plot is Milkha’s youthful, blatantly frank and fleeting romance with Sonam Kapoor. Kapoor doesn’t have much to do in the movie except filling pails of water and walking from the public water pump to her house. The movie claims Milkha took up the army job in a bid to try and prove his worth as an honest individual to Kapoor who objects to Milkha living a dishonest life. This is where the story seems to mildly digress from real life – records say Milkha took up the army job on the recommendation of his brother Malkhan. Milkha’s relationship with Havaldar Gurdev Singh, athletic coach at Milkha’s Secunderabad army center is moving in many ways. The man who introduced Milkha Singh to the track & field world and played a huge hand in developing the Flying Shikh into India’s greatest athlete is portrayed by the ever brilliant Pawan Malhotra. Divya Dutta, playing Isri Kaur – Milkha’s elder sister is in fine form throughout the movie too. The one disappointment in the starcast is Yograj Singh (yes, Yuvraj Singh’s father) who plays India Coach Ranveer Singh. The guy has a bigger role to play than Sonam Kapoor’s Biro and botches it up badly. Over-dramatic and poor timing all along, one makes you wonder what made ROM pick this guy for such a pivotal role. Prasoon Joshi, writer and lyricist deserves a huge round of applause on both fronts. The dialogue, timing and emotion is perfectly balanced throughout the movie and rarely over-done. The clear winner by miles in the entire (greater than) 3 hour marathon though is Farhan Akhtar – intense, present and near perfect at every single phase of the movie. The actor has come a long long way from lasting 15 minutes in his first workout session years ago at Otters Club, Bandra to training 6 hours a day towards developing the physique required to play the legendary Milkha Singh. A moment that stands out is his interaction with Perizaad (India’s swimming champion) in the pool. Milkha is training after disappointing himself and his coach in the 1956 Melbourne Olympic games after allowing himself to be distracted into a pointless romance with an Australian girl. “Maafi chahta hoon. Me apki insult nai kar raha, lekin meri khudse jung hai” (Forgive me. I’m not insulting you; but I’ve a battle against myself) says Milkha and wards off the advances of a girl that the entire track & field team would die for. The moment defines Milkha’s determination and hunger, his passion, discipline and hard-work, his will-power and his pain all rolled into one. 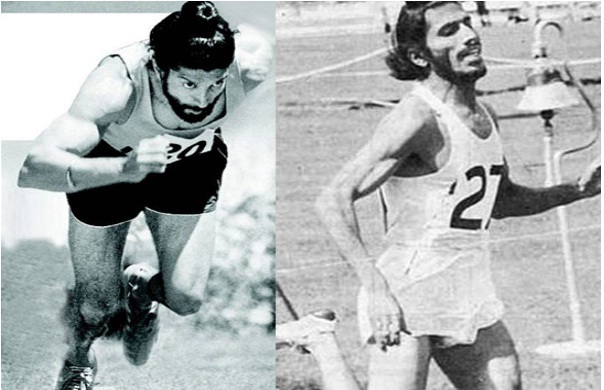 There is a remarkable resemblance between Farhan Akhtar and the real Milkha Singh as Akhtar crosses the finish line in his white singlet to defeat traditional nemesis Abdul Khaliq in an emotional return to Pakistan and you can’t help but feel pained by the fact that there is so much about this great man that most of us never knew. A special mention for the exuberant, cheerful and rebellious performance put in by Japtej Singh as young Milkha – easily one of the most challenging roles in the entire movie and executed with pure precision. Bhaag Milkha Bhaag is an inspiring tale of a tragic-stricken young boy, that refused to give up, learned to survive and build himself a life out of sheer will-power and hard work. The tale also subtly speaks of countless families that have lost everything during Independence – a sacrifice that both countries will continue to bear the burden of for several decades more. It is ironic in many ways, that the title of ‘The Flying Sikh’ was conferred upon Milkha after a comment made by Ayub Khan, the then general of Pakistan describing Milkha’s whopping win over Abdul Khaliq, but also fitting in just as many ways. ROM mentions ‘Bhaag Milkha Bhaag’ is not a story about Milkha Singh but in truth about the spirit of Milkha Singh and the colors of his life. I must admit, most of our generation only knows Milkha Singh as the Flying Sikh – the guy who almost won us a track & field Olympic medal; ‘Bhaag Milkha Bhaag’ helps us understand better what it is, that makes Milkha run…or fly! Farhan Akhtar & Prasoon Joshi deserve a huge applause!